Rick was born in Pueblo Colorado and when he was just 9, he got a cassette tape recorder for Christmas, and knew he wanted to be on the radio! Rick worked at several stations in Pueblo Colorado and Laramie Wyoming, before moving to Las Vegas in 1986 He had been on the radio there for over 30 years. Weekdays 2pm – 6pm Billy was born and raised in the suburbs of Chicago. He has been all over the country with stops in Denver, San Francisco, and Orlando. He has been on the radio in Phoenix for the past 5 years. Billy loves interacting with you and making your ride home fun and stress free. His favorite artists are Luke, Blake, Miranda, and Carrie. Weekends Ralph Davis was born and raised in northern Kentucky, rooting his affinity for country music and culture. He was drafted to serve our country in Vietnam when he was 19. Shortly after his time as a Light Weapon Infantryman, he moved to Arizona hoping to find job opportunities to soothe his passion for broadcast. He attended Ron Baile School of Broadcast. Weekends Erika grew up in northern Arizona and central Texas. She is a former Hashknife Rodeo Queen and professional barrel racer. She worked for Atlantic Records in Los Angeles for 9 years after graduating from ASU with a degree in Broadcast Journalism. She returned to the valley to work in radio at various stations as a mid-day on-air personality and music director. 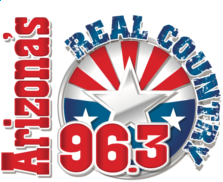 ON AIR Personality W. Steven Martin started his Country radio career as Morning Drive host at KRDS, Tolleson, Arizona. Despite his remarkable radio career, he is best known for his many Humanitarian achievements, especially his Christmas toy drive which he started in 1978 and continues to be one of the largest charitable endeavors in Phoenix to this day.